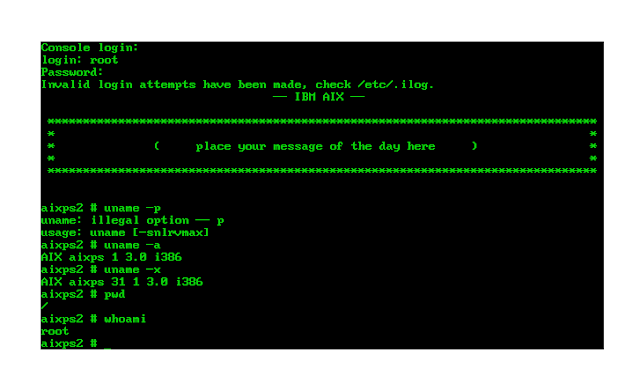 AIX 1.3 for PS/2 is unique in that it is the only AIX release that runs on the Intel i386 processor architecture. IBM's announcement letter is still available online and starts off by describing AIX 1.3 for PS/2 as "AIX PS/2 Operating System Version 1.3 and its associated Conditions of Use Products (COUs) provide full hardware support and exploitation for all models of IBM PS/2 system units based on the 32-bit INTEL 386sx-16MHz up through the INTEL 486DX2-66MHz, utilizing both IBM Microchannel or IBM AT-Bus architectures." As a DEC alumnus, the only IBM operating system I had ever used was PC DOS. This was by choice at the very beginning of my tryst with computing. DEC hardware and operating systems were being used in all sorts of interesting factory shop floor real-time systems, SCADAs, Nuclear Power Plants, Space technologies, Telecommunications etc. while IBM mainframes and minicomputers were more popular in (boring!) banking and financial systems. 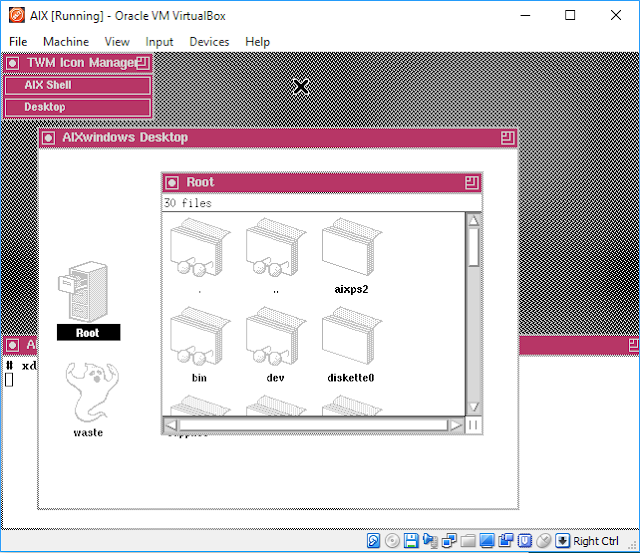 I have since come to regret that unfounded bias, and when my favorite blogger posted an article on running AIX 1.3 inside VirtualBox I jumped on it and got it to work on my Lenovo Legion Y720 gaming laptop. And, I also learned "AIX" actually stands for "Advanced Interactive Executive". 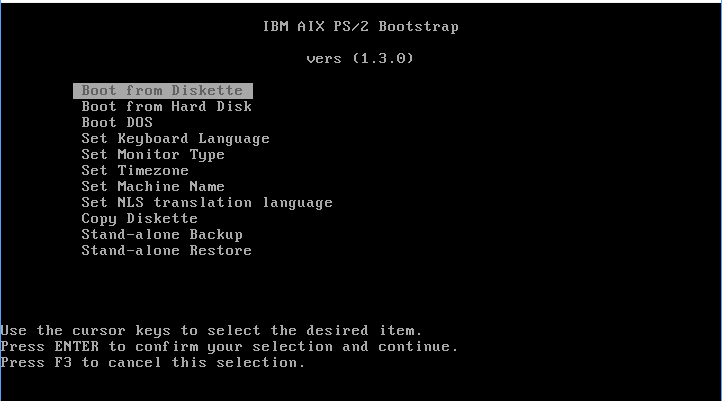 AIX for PS/2 supports a X Windows Motif based graphical desktop. 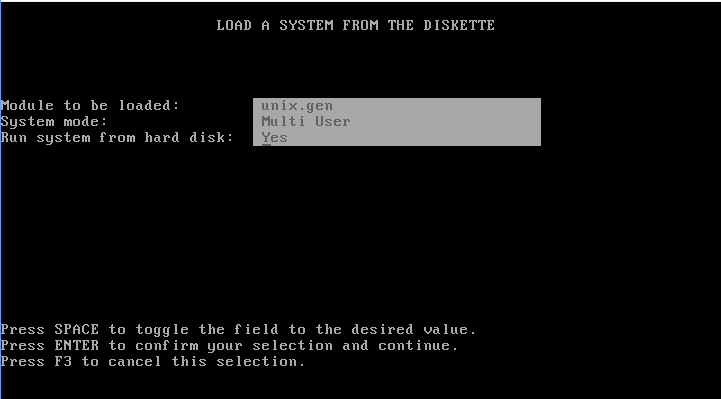 A quick way to check the X11 desktop is to type in "xinit" which launches a X11/Motif graphical interface with a terminal, and then type in "xdt" to launch the IBM Graphical Desktop. The complete AIX for PS/2 X Windows Users' Guide is still available online. Proceeding from here, the Bootstrap will ask for the 2nd floppy disk to be inserted and continue booting AIX from there. 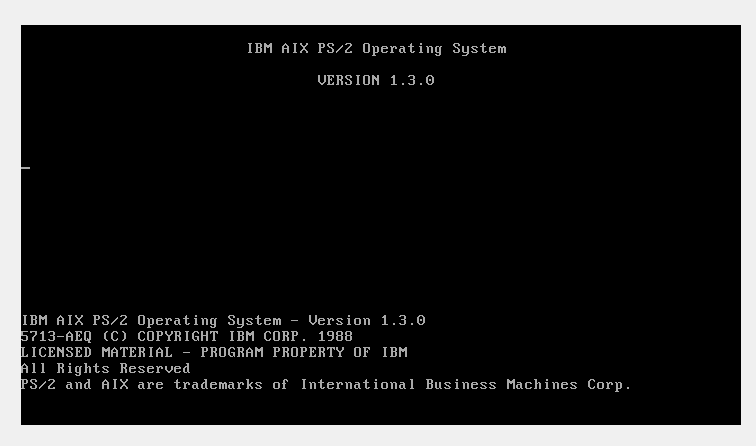 Soon, a IBM AIX PS/2 Operating System login prompt is presented. The X Windows/Motif graphical desktop can be launched using the "xinit" command after logging in. This launches the GUI desktop with a shell command prompt window. 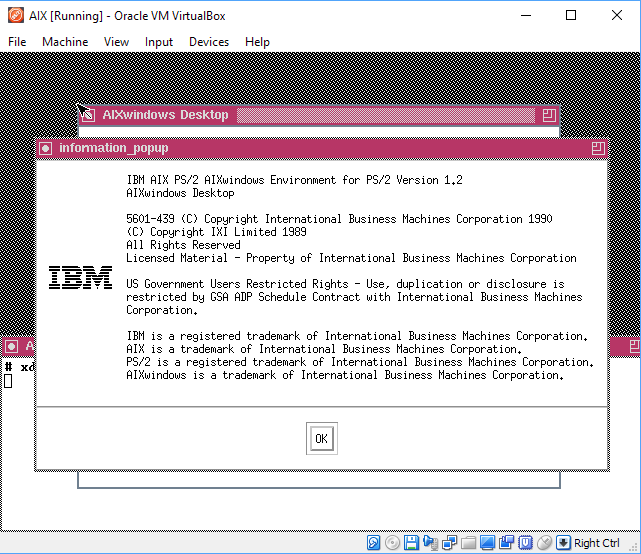 Issuing "xdt" launches the IBM AIX PS/2 AIXwindows Desktop. In addition to the X Windows programs in /usr/bin/X11, additional AIXwindows software applications like "aixterm" are included. I have been unable to present any of this to AIX PS/2 in the VirtualBox hypervisor and will gladly welcome ideas to put AIX on the network in comments you can leave below. 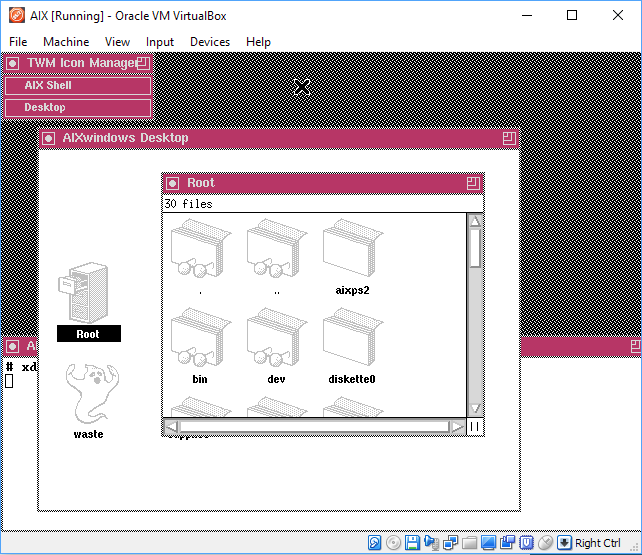 You can download the Oracle VirtualBox appliance for hobbyist use only from my google drive.